With the help of Kevin Garnet, NBA commissioner Adam Silver announced a new deal with Anta. 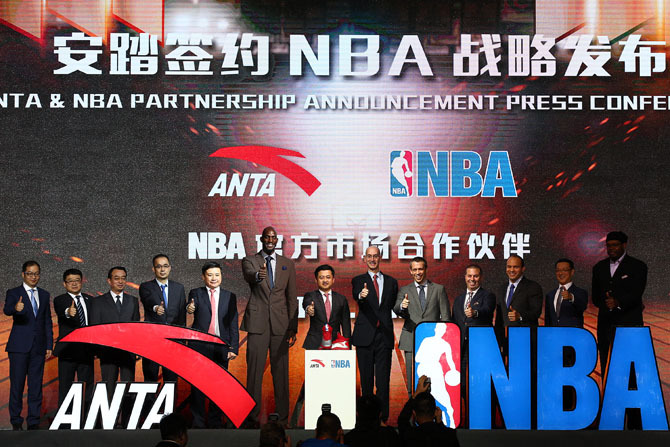 Earlier today, with the help of Kevin Garnet, NBA commissioner Adam Silver announced a new deal with Anta, which makes the Chinese-based brand an official partner and merchendiser of the NBA. The deal will include the trademarks to all 30 teams, which will allow Anta to produce co-branded footwear with team and NBA logos. While this doesn't appear to have a major impact in the U.S., Anta expects that the exposure gained in China will help it become the biggest domestic brand in basketball within the next two years, according to Yahoo.